Based on the teachings of His Divine Grace A.C. Bhaktivedanta Swami Prabhupada, ISKCON Bangalore has been presenting the treasure house of spiritual knowledge to youth through ‘Friends Of Lord Krishna’ (FOLK) since the year 1997. What began as a small endeavor has now transformed itself into an enormous activity with hundreds of youngsters making their way to ISKCON every Saturday and Sunday for a gala gathering of an enjoyable evening of spiritual classes, music, dance and not to forget prasadam—delicious food offered to Lord Krishna. The FOLK program employs highly interactive sessions handled by experienced faculties who have dedicated their lives as missionaries for over 20 years. A typical program on Sunday consists of teaching how to apply Vedic wisdom to current world realities. Solutions are provided to difficult problems that youth encounter in their daily lives, such as how to manage stress, how to improve memory and concentration, how to get rid of bad habits, how to excel in life, etc. The youngsters are provided opportunities to showcase their talents and skills for the pleasure of the Lord. The youngsters are also taken through personality enrichment courses to explore their deeper selves and encourage them to become more reflective and introspective—a real need in today’s chaotic times. Art of Mind Control is one of the most popular short presentation workshops where the participants learn to harness the untapped potential of the mind by techniques of mind-control based on the timeless wisdom of the Bhagavad-gita. and other secret principles based on Bhagavad-gita; intrigue one’s intellect and practically enlighten the participants to apply the secrets of success in their personal and professional lives. Besides dealing with the presentations on such topics, the participants are also exposed to a thoroughly spiritual experience in the serene atmosphere of the temple. The participants also learn practically the meditation technique for the modern age namely ‘Mantra Meditation’ of Hare Krishna maha-mantra. A short written quiz was conducted based on the above sessions in the workshop and prizes were awarded to the quiz winners. The participants were also awarded an ‘APPLIED SPIRITUALITY’ certificate on the completion of the course. The workshop has been so effective and successful that the students have continued to practice the principles learnt in the workshop in the form of daily meditation and are also taking guidance from the FOLK Volunteers in this regard. These were three personalized sessions one-on-one at a date and time convenient to the participants. Expert Guides from ISKCON Bangalore’s FOLK department conducted these personal one-on-one interactive counseling sessions during the year 2011-2012. The convenience of date and time and locations, in a short power packed duration of one-hour, and the strict confidentiality maintained regarding the challenges shared by the participants made it very comfortable and approachable for those youngsters who were undergoing personal turmoil in their life. The solutions presented in the counseling by the FOLK Guides of ISKCON Bangalore were based on the timeless wisdom of Bhagavad-gita and hence were a sure shot formula for overcoming the challenges. These were three personalized sessions one-on-one at a date and time convenient to the participants. Expert Guides from ISKCON Bangalore’s FOLK department conducted these personal one-on-one interactive counseling sessions during the year 2011-2012. The convenience of date and time and locations, and a short power packed duration of one-hour, and the scientifically presented answers for all the philosophical queries by the participants based on the timeless wisdom of Bhagavad-gita made these sessions very effective. After attending the basic programs of FOLK based on timeless wisdom of Bhagavad-gita and learning the practical principles to apply in their life, the participants are further guided in a systematic manner by being enrolled into advanced modules of FOLK which have classes every Sunday from 4.00 pm to 6.00 pm followed by Kirtans and delicious Krishna Prasadam. 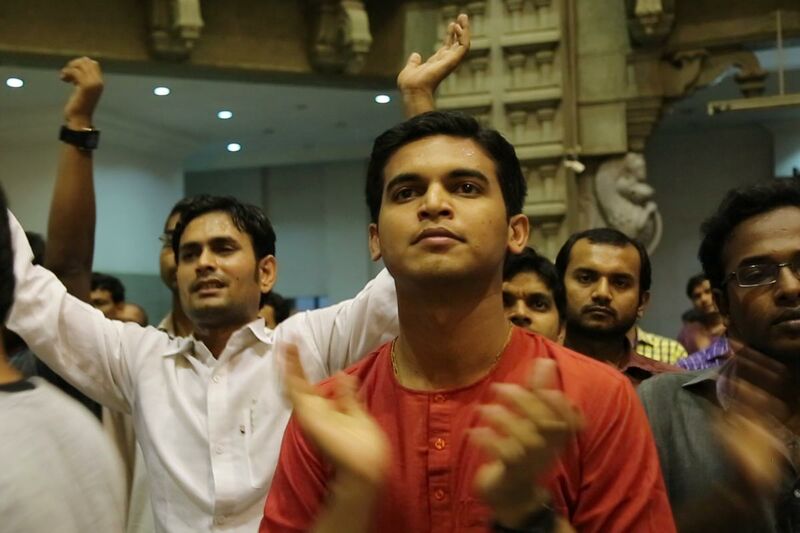 The students get exposed to the Krishna Consciousness way of life systematically in a step by step advancement in the science and techniques of practical devotional service. The participants take some spiritual commitments to follow during the pursuance of each of the courses, which helps them grow in Krishna Consciousness.